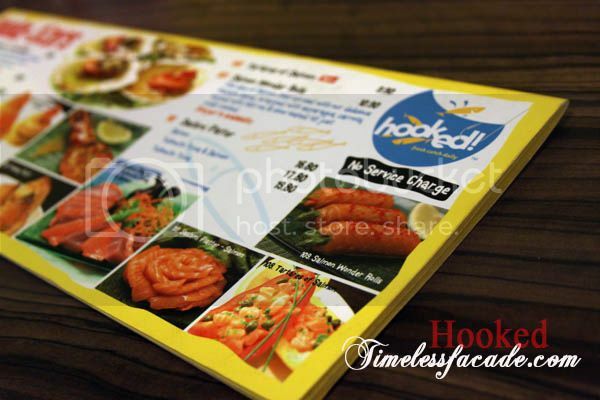 Was wandering around Thomson road after some grocery shopping at NTUC finest and chanced upon Hooked!, which has another outlet located at Rail Mall in the western part of Singapore. 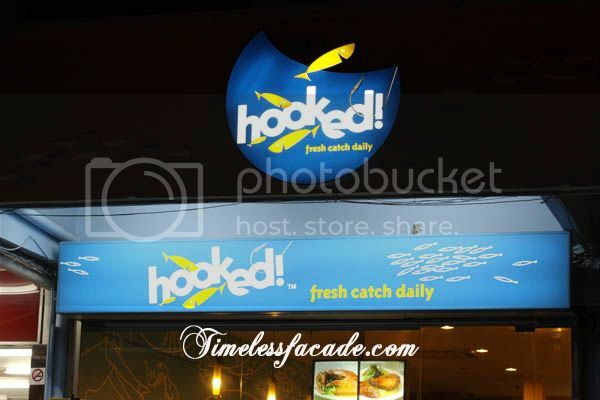 With Hooked! evidently being a seafood restaurant, I, as a meat lover and occasional fish consumer, had my reservations. 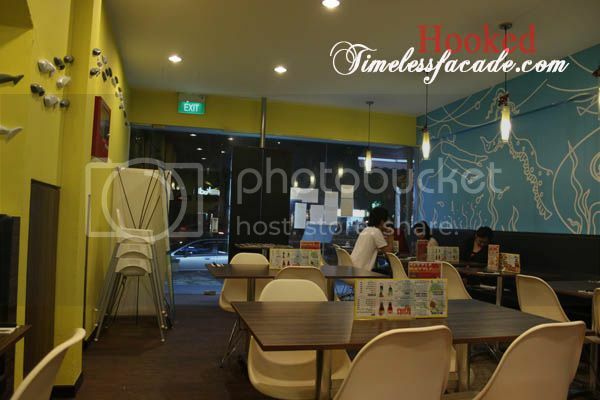 The interior is a cheerful yellow and blue with sketches and ornaments of sea creatures plastered onto the walls - very in tune with the seafood aspect of the restaurant. Some background music would have been appreciated though, as the place did seem a little too quiet and every whisper could potentially be echoed around. From my personal experience, not many places whip up a mean baked rice and Hooked! wasn't about to prove me wrong. Having said that, I would say Hooked! 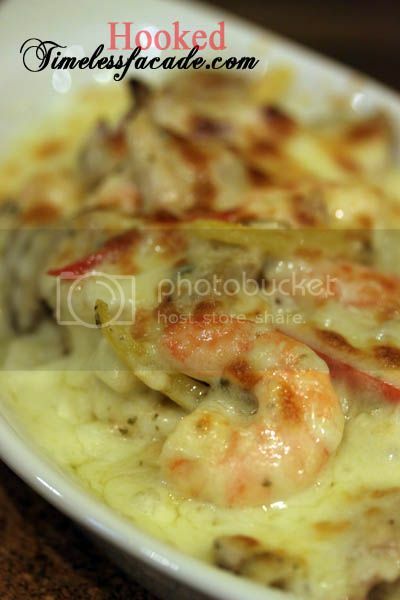 still managed to do some decent work on the rice, with the cheese gooey, a little chewy and of course, the relatively generous serving of seafood entrenched within. Although I am no big fan of snapper, I surprisingly took to this dish quite a fair bit. 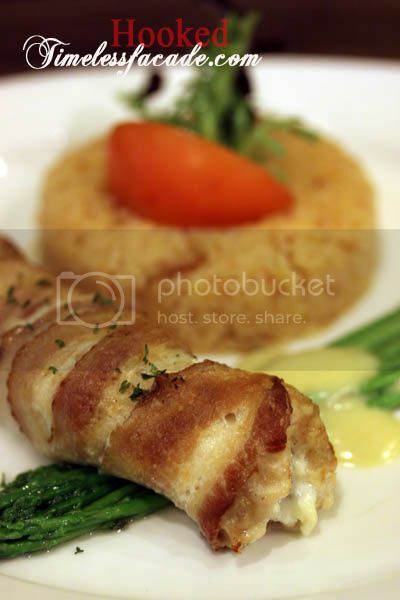 The delicate fish was nicely wrapped around in bacon, which had a nice crisp to it and contrasted very well with the texture of the fish. It would have been great if the fish had more natural sweetness though. A serving of rice and asparagus completed the dish. 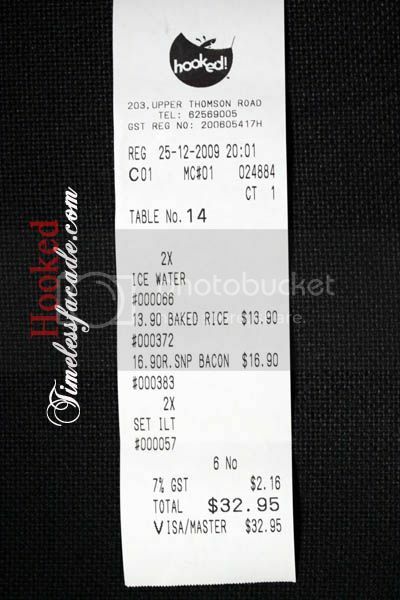 Personally, I feel prices are quite reasonable at $33 for a 2 pax dinner, which came with 2 drinks. Having no service charge was definitely a plus and service was good, though it could have been due to the lack of crowds. Still, I would give them the benefit of the doubt. I finally saw your site after so many years.....hooked! I am surprised you have to pay cash over there. Too bad I didn't bring much and have to go another restaurant nearby.